Spanish painter. Although he is sometimes thought to have been a Sevillian painter, his career is documented in Madrid. Barrera enjoyed considerable prestige and authority within the artistic community of the Spanish capital and in 1634 and 1639 represented his profession in significant legal battles concerning the status and rights of painters. 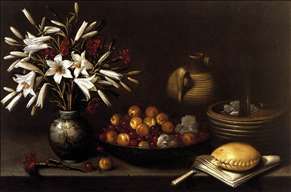 However, Barrera s known paintings, all of which are still-lifes, are those of a derivative artist of modest abilities. In Still-life with Basket of Grapes, signed and dated 1642 (Florence, Uffizi), his arrangement of objects in a window-frame and on a stone ledge derives from works by Juan van der Hamen y Len but without that artist s refined compositional sense or mastery of pictorial space. 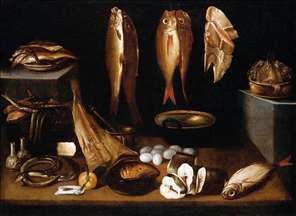 The rather weak modelling of objects in this painting is consistent with Barrera s other still-lifes, which are further characterized by their light tonality, bland colouring and monotonous brushwork. Comparable stylistic features are found in the more accomplished still-lifes of Antonio Ponce, with whom Barrera is documented in the 1630s. Barrera s best works are those depicting the Four Seasons, signed and dated 1638 (Seville, private collection). These are still-lifes of abundant seasonal foodstuffs and, in landscape settings, large symbolic and genre figures drawn from traditional iconography. Although Barrera s handling of the figures underscores his limitations as an artist, these large and ambitious paintings constitute a charming and rather unusual series for the time in Spain. 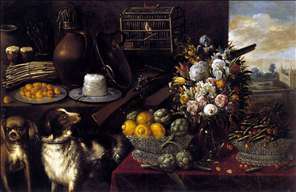 See more details about "The Month of May"
See more details about "Still-Life with Flowers and Fruit"